The Diminutive Review: Need some Christmas PJs? 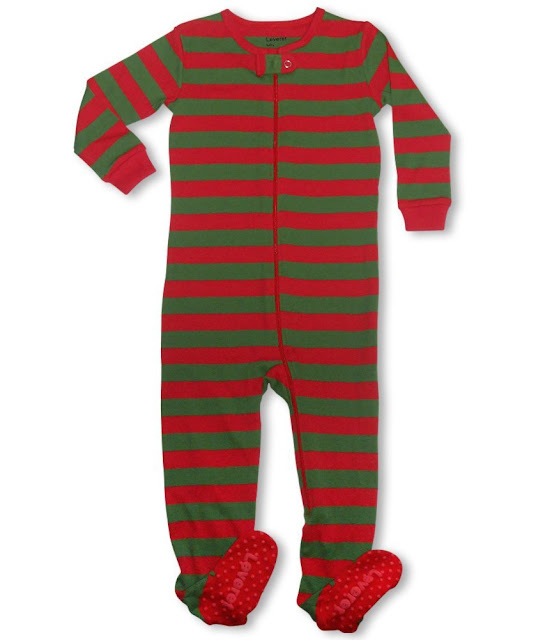 Even though I have posted about Amazon's Leveret pajamas twice before (here and here) I still had to include this Christmas stripe footed sleeper for those of you who are Leveret fans. Somehow I missed this red/green color combination, though apparently the rest of America did not because Amazon is carrying these in 12-18 months, 18-24 months, 2T and 3T. These have been marked down from $28.50 to $12.99 and ship for free! My little people are getting some Leveret PJs for Christmas and I must say that the quality to price ratio is really high. These are nice pajamas and make a great gift; a perfect way for all of you grannies, aunties and godmothers to send your little loves a bit of holiday cheer. I could never tire of small, grinning kiddos in red and green striped pajamas at Christmas! Here are some other Leveret holiday pajama sets ... the purple snowflake set is especially tempting. I'm hooked on these pajamas. I wish they came in big girl sizes, but my younger two have drawers full of Leveret this year!